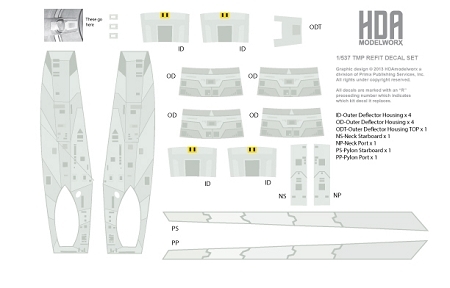 Highly accurate TMP Refit strongbacks, deflector housing, and blow out panel decals for the Polar Lights 1/350 U.S.S. Enterprise Refit model! U.S.S. Enterprise highly accurate strong back , deflector housing and pylon blowout panel decals for the AMT 537 (also referred to as 600 scale) U.S.S. Enterprise Refit model! These fit the original 1979/80 smoothie release as well as all later versions with the scribed in paneling patterns. These decals are based upon our 350 scale versions and have as much detail as we could pack into such a small size!